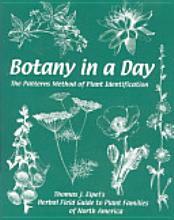 My copy of Botany in a Day by Thomas Elpel arrived yesterday and I am hooked. Clearly written, humorous but without fluff and to the point, tightly structured, and beginning in the beginning and ending with the end. Just the way I like my books on the structure and evolution of plants. I plan to learn a lot! That’s it for today. Just a plug for this wonderful book.